ALOHA! We are the Hula group Hau’oli in Sophia Universiy. Our group name “Hau’oli” means “Happy” in Hawaiian. We will dance with all our hearts so that we can deliver “happiness” to everyone. Aloha everyone! We are Sophia University Hula Halau Hau’oli. 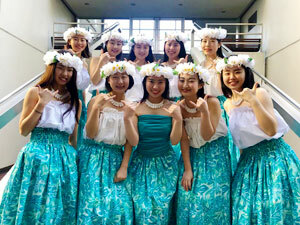 We will perform our best to send hau’oli (“happiness” in Hawaiian) for the audience.